Innovative cleaning brush and fluid dispenser holds 4 fl. oz. of lubricant that dispenses by the push of a button. 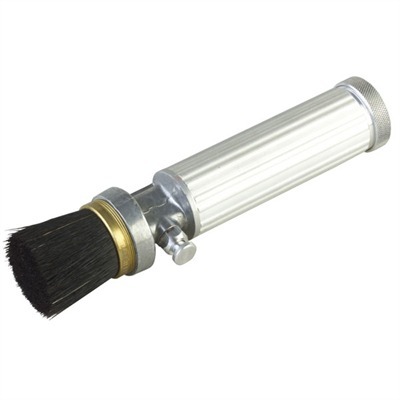 Soft, natural-bristle brush cleans dirt and debris without damaging your guns finish and helps spread the liquid released from the reservoir. Excellent for lubricants, cleaning fluids, or any liquid you want to apply to your firearm. Perfect size for the shop or the range. Doesnt include lubricant. Mfg: Marsh Shipping Supply SPECS: Aluminum. 8'''' (20.3cm) long, 1 1/2'''' (3.8cm) diameter. Reservoir holds 4 fl. oz. (118.3 mL).